Provide comfort for the family of Harold Lovejoy with a meaningful gesture of sympathy. 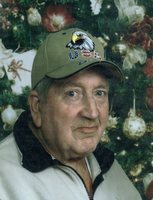 Harold Edward Lovejoy, 85, of Charleston passed away, Monday, March 18, 2019 at CAMC Memorial Hospital. He was born in Hugheston, WV to the late James and Edith Lovejoy. He was also preceded in death by his wife of 66 years, Betty Lovejoy; brother, James Lovejoy; sisters, Eunice and Leota Lovejoy; and grandchild, Markie Hanshaw. Harold was a very loving husband, father, grandfather, and great grandfather. He served his country in the U.S. Army and retired from Kanawha Co. Board of Ed. as a Bus Driver. Harold like to collect watches, guns, and knives as a hobby. He is survived by his sons, Stephen Lovejoy and wife Linda, Allen Lovejoy and wife Vickie, Mark Lovejoy and wife Diane; daughters, Linda Ball and husband Tony, and Kimberly Johnson; brothers, Bob and George, and Otis "Milford" Lovejoy; sisters, Brenda and Sharon Lovejoy; eleven grandchildren, eight great grandchildren, one great-great grandchild. A service will be 1:00 pm, Friday, March 22, 2019 at Hafer Funeral Home. Burial will follow at Kanawha Valley Memorial Gardens, Glassgow. Military rites will be honored by the American Legion, Post 61, of Clendenin. Family will welcome visitors from 12:30 pm to 1:00 pm at the funeral home. Hafer Funeral Home, 50 N. Pinch Rd., Elkview, is assisting the family with arrangements. To send flowers in memory of Harold Edward Lovejoy, please visit our Heartfelt Sympathies Store. Provide comfort for the family of Harold Edward Lovejoy by sending flowers. To the Lovejoy family, my heartfelt condolences for your loss. Please find comfort in the knowledge that soon God will wipe out every tear from our eyes, and “death will be no more, neither will mourning nor outcry nor pain be anymore. The former things (will) have passed away.”(Rev. 21:3,4) May this promise give you comfort now and a real hope for the future. My deepest sympathies.